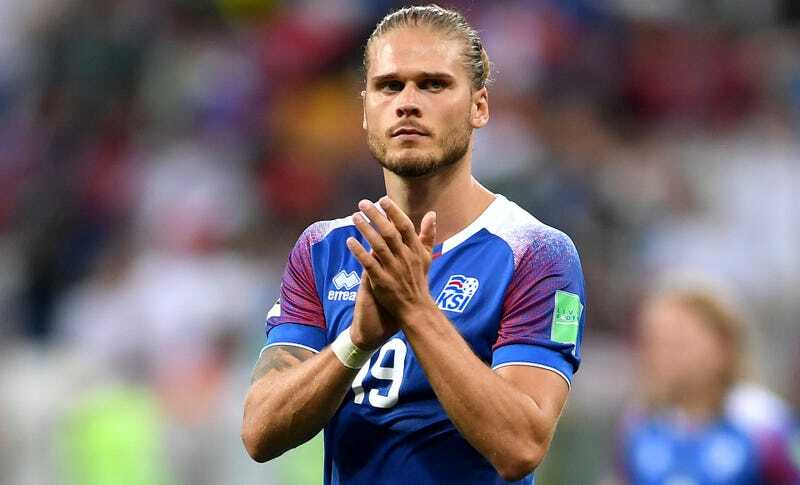 Coming into the World Cup, not many people had heard of Icelandic winger Rúrik Gíslason. Then he stepped onto the pitch as a substitute for an injured teammate during his country’s match against Argentina and the whole world realized that he is hot as hell. Gíslason has spent the majority of his career hopping around from team to team in various Scandinavian leagues. He’s spent the last few years playing in Germany’s second division, currently with Sandhausen. With that resumé, it’s not a shock that he wasn’t exactly a household name worldwide before this summer. Nevertheless, Gíslason quickly made a name for himself this summer. Not so much with breathtaking skills with his feet but with his jaw-dropping face and physique. He has a jaw you could forge a broadsword on and abs that could grate cheese. These facts did not escape the more prurient-minded soccer fans, as demonstrated by his rapidly ascending Instagram follower count. Just a week after his World Cup debut, Gíslason’s Instagram account now has about one million followers. Never underestimate the power of horniness.